FEATURES & OPTIONS: Double-sided, full-bleed, full color printing. 5 mil gloss lamination, rounded corners, flush cut finishing, slots or hole punch, lanyards or neck chains available upon request. 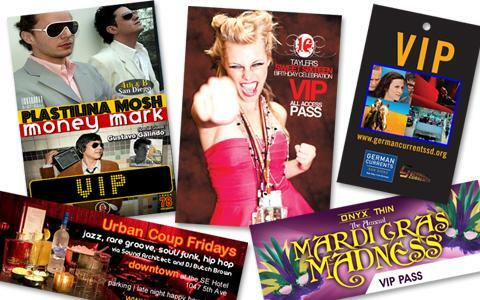 Take your event to the next level with professional laminate VIP passes and cards. These cards can be used for everything from backstage passes to conference name tags. Laminates and passes are available with a a modern flush cut and can be delivered with an optional lanyard. Many sizes to choose from and custom sizes are available.